When the softball team needed a new pitcher, it didn’t have to look too far. Christy Cabrera, who played outfield last season, stepped up to the mound and proved her worth. Cabrera took on a pivotal role for her senior season, and became a pitcher. 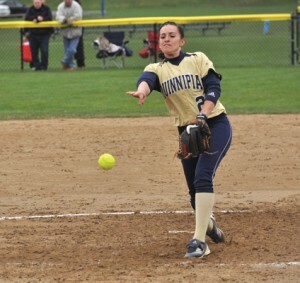 Cabrera transferred to Quinnipiac last year after playing two years of softball at Iowa Lakes Community College in Esterville, Iowa. At ILCC, she posted 122 hits and 81 RBIs before transferring to Quinnipiac. Last season she served as a second baseman and outfielder for the Bobcats. Cabrera also recorded the fourth-best batting average last season, hitting .283 and slugging .325. She was second on the team with 54 hits. Cabrera pitched almost her entire softball career until college. She served as the primary pitcher in high school and pitched on her travel team. She did see time as a pitcher at ILCC but primarily served as a fielder. “I remember Lauren (Salgado) last year, when we would always play in the outfield I would pitch to her, and she said I should just do it and that I actually threw it harder than she thought,” Cabrera said. Last year during the Northeast Conference tournament, the Bobcats suffered a few injuries and Cabrera understood the need for players to step up. She wants a different outcome in the NECs than last season, when they lost in the finals. Cabrera’s first start on the mound was Feb. 26 against Iona. Her first win came on March 10 against Saint Joseph’s in Riverside, Calif. when the Bobcats won 1-0. Cabrera faced 28 batters and struck out three. “Christy has shown throughout the course of the season that she has the capacity to shut down an opposing offense,” Fairchild said. Cabrera has pitched 12 games this season, starting in eight. She has also recorded 28 strikeouts on the season with a 4.51 ERA. As the Bobcats head into more conference play, they have a stronger, more confident Cabrera on the mound to help contribute to the team’s success.